Note added on 10/11/11-We are getting a lot of hits on this site. Just want to say the book that this post came from, the Bare Bones Ecology Energy Handbook, is available as a free download on the right side of the blog. You can easily find books that describe all the hundreds of chemical reactions that are required for the two overall processes of photosynthesis and cellular respiration that support life in our earth ecosystem, for example Lehninger Principles of Biochemistry by David E. Nelson. Biochemistry is the chemistry of living things that focuses on organic molecules and their interactions in cells. It’s not so easy to find an explanation, as we have developed, of the importance of the flow of energy that supports the emergent property of life at all its levels within the earth ecosystem. The overview, of course, you have heard in almost every post of this internet project. For life to exist in The Creation as we know it today, it requires many things, but we are talking about energy and. And it requires that the energy be available to every living part of the ecosystem. We have used the term “flows through,” because the energy comes into the system as light, a higher form of energy, and leaves as heat, a lower form that can not recycle back to light. The energy that can be used to sustain life is distributed throughout the system is in the organic molecules that we use as food, (and in the case of humans also fuel and raw materials run our economy. Molecules are atoms that are joined together by energy bonds. Organic molecules are very large molecules, such as proteins, carbohydrates, lipids (fats and oils) and nucleic acids, that are made inside living cells, including all of our cells. Organic molecules make up most of the structures of our bodies and also direct most of the functions, such as thinking, moving, breathing, all the things we do to stay alive. The energy bonds of molecules are the energy that is used to sustain life; therefore we have referred to this kind of energy as organic energy, as a type of energy, because there are quite a few different sorts of energy bonds. Plants and photosynthetic bacteria, and also phtosynthetic one-celled eukaryotic organisms (protista), can do photosynthesis because the cells contain chlorphyll to absorb most of the energy from light, and then they can use that energy to make organic molecules in a process called carbon fixation. None of these processes is just one biochemical reaction. Each consists of a series of dozens or hundreds of chemical reactions. To cause these chemical reactions to happen at the right time in the right place, the cells contain a set of enzymes that are required to direct specific chemical reactions. An enzyme is a protein that functions as a catalyst. A catalyst is a anything that causes a reaction to happen but is not used up in the reaction. A chemical reaction is a change that happens among atoms or molecules. Each kind of atom or molecule is unique; therefore the ways in which they can or can not fit together depend their unique characteristics. That is a subject for chemistry and biochemistry. We generalizing about chemical reactions. Enzymes direct most reactions. Because the enzyme is not an integral part of the reaction, it is not permanently changed during the reaction. Therefore it can be used again to cause another of the same kind of reaction. Enzymes are specific to reactions. Each reaction requires it’s own kind of enzyme. By controlling the enzymes, the cell can control the reactions. We will discuss that fact later when we cover the second major requirement of life. Photosynthesis is a multistep biochemical process that includes the absorption of energy, as described in the previous post, and carbon fixation. Carbon fixation is the uphill process of taking carbon dioxide from the air and using it, along with water and energy, to make glucose, as diagrammed below. The overall process of photosynthesis and carbon fixation involves a complicated pathway consisting of many small steps during which small changes are made as energy is transferred under the direction of multiple enzymes. In eukaryotic cells, one kind of specialized organelle, the chloroplast, is responsible for organizing the overall process of photosynthesis. Organelles are composed of membranes (lipids) that contain all the necessary enzymes (proteins), organized in the best way to cause these complicated reactions to occur. The glucose product is then made available to the entire cell, and all the cells of the body of the plant (because plants also have circulatory systems). The oxygen product is released into the atmosphere. We need the oxygen to breath and we need organic molecules for our food/energy. Glucose is a carbohydrate. The plant makes other carbohydrates from glucose. It also can make lipids and it can add nitrogen and other kinds of atoms to make proteins and nucleic acids and other organic molecules that it needs to survive. At every step in the network of energy transfer from one creature to another, about 10% of the energy is wasted. It goes away as heat without doing any life work. Except of course to help keep us warm. The more work we do, the more heat is released in our cells. If we are very cold, we run around flapping our arms and we wear clothing to trap this released heat next to our skin. But eventually all the energy that was in the original plant is lost and we get more energy by eating. But in the meantime, while the organic materials are circulating in the ecosystem, all the plants and animals of the entire ecosystem are keeping their bodies alive by metabolizing the organic molecules. Metabolism is the process — actually it is thousands of processes — of changing those organic molecules around to make all the different parts of our bodies: muscles, heart, eyes, all the structures of our bodies are made of organic molecules or they are made by organic molecules. That is a lot of work! The energy to do this work comes from breaking down the glucose molecules in the tight control of the cells so that the released energy is captured, still in the form of chemical bond energy. The energy is taken from the glucose to energize some other important cellular function, possibly your muscle movement, or perhaps the light receptors in your eyes, and so the glucose atoms are no longer bonded together and are released from the cell as carbon dioxide and water. Oxygen bonds with carbon or hydrogen because it is a downhill reaction — the energy bonds (added together) contain less energy in the carbon dioxide and water than they did when these atoms were bonded in the glucose molecule. Notice that it requires oxygen to burn glucose, but it wouldn’t be correct to say that we are burning the oxygen because the oxygen itself is going from a smaller molecule or atom to a larger one with more energy bonds. The energy is released from the glucose – just as energy is released from the organic compounds in wood or gasoline when these are burned in the presence of oxygen. The oxygen is required to remove the waste products (carbon and hydrogen) of the reaction so the energy can be released and used to make other molecules in the body. But of course it is not just one reaction. It is a series of dozens of reactions that are catalyzed by enzymes. The overall process is known as Cellular Respiration. Cellular respiration is the intracellular process of breaking down glucose to release energy, carbon dioxide and water. In eukaryotic organisms, these reactions are organized in organelles known as mitochondria. Mitochondria are organelles that are specialized to direct the process of cellular respiration. You probably already know that plants release oxygen that the animals require to breath, and the animals release carbon dioxide that the plants require to “breath.” Almost everyone knows this, but did they tell us why we need to breath? Or did they let us believe the plants are here on earth so that people can breath oxygen and eat? No Way. Our lungs and heart are helper organs. They help to get the oxygen to the cells so that the cells are able to release energy by doing cellular respiration. One-celled animals don’t need the lungs and heart, but they do need the oxygen in their environment. Plants “breathe out” oxygen, because it is a waste product of photosynthesis and carbon fixation. They need to get it out of the way so they can do more photosynthesis and carbon fixation. Animals and plants “breathe in” oxygen so that each cell of the body will have the oxygen it needs to do cellular respiration to release the organic energy it needs to stay alive. 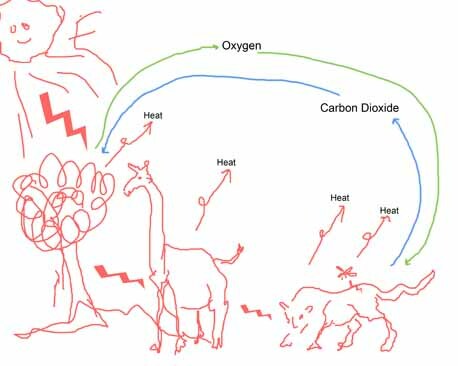 Animals and plants “breathe out” carbon dioxide because it is a waste product of cellular respiration. Plants “breathe in” carbon dioxide because it is a substrate in the process of carbon fixation the process that provides food for the whole ecosystem. It is the miracle of life that life supports life and life requires life. 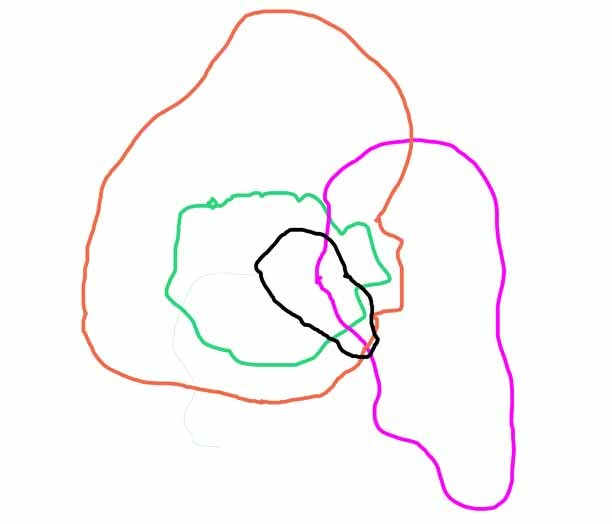 Nothing dominates, not even that lion in the diagram below; everything interacts so that all may survive, so long as the balance is maintained.